← Random Panel: Is it too much to hope he's talking about Britney? That's "Rescue on Fractulus", also from 1984. 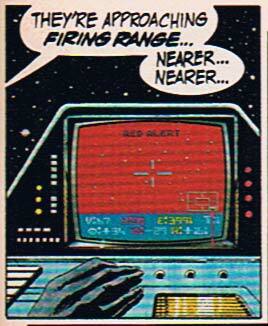 Maybe in this case the comic artist just took his Atari and multiplied by 1.5 instead of 10. The graphics! The fonts! The complicated, intricate, and hack-proof interface! The jaundiced yellow, nausea-inducing background! 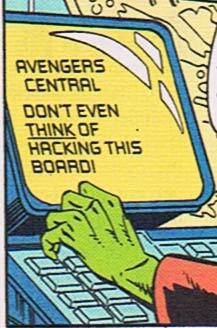 We shouldn't be surprised by the incredible sophistication of this 1990-era computer system, of course, given that The Avengers had the likes of Hank Pym and Tony Stark to build their IT department. Comics: Imagining tomorrow as today since at least yesterday! This entry was posted in Fantasy & Sci-fi, Super-Hero Stuff. Bookmark the permalink. Hi Jeff, it’s been awhile. Finally got to the internet, and I’m glad to see you’re keeping the laughs going. Hope the Facemaker is going well, now it’s time to see what’s been going on with the old original app updates. Take care, dude, hope to be on more often. Oh, man! I’ve played that game. I’ve beat that game. 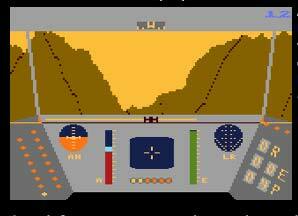 I played that on my Atari 800 … What was it called again? Star Raiders? I’d say they took a screen shot of it, but Atari’s don’t have that feature and that was probably made before screen shots were an option. It’s a flaw inherent in the imagination, I believe. It was the same for movies, too, like THX 1138 and Tron. In the first, they had a coputer running everyhing EXCEPT the humans still had to put the nuclear power cells into the braincases! And Tron, that was just a big screen video game. its hard to write far ahead in the future and still be comprehensible to the reader. especially when you are working with space ships and weapons and such. And as Robert ball raised the question just how much are humans going to be needed. could a human program the attack pattern then go to bed?